THE GREEK COLLECTIONS AT THE HARVARD LIBRARIES - This is the official blog of the Modern Greek Section of the Harvard College Library. It was created to showcase the items in the Modern Greek Collections at the Harvard Library with the aim of inspiring students in the Department of The Classics and beyond to further explore the resources available in the collections. All posts contain links to the item record in the Harvard Library System. Every other month they post a list of recent acquisitions. 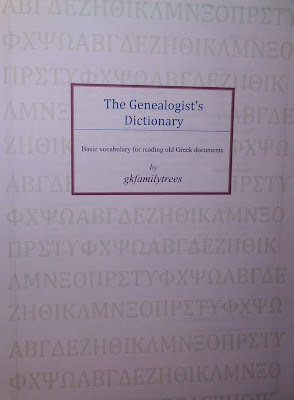 Our friend, Gregory Kontos (gkfamilytrees.com), has published a booklet titled THE GENEALOGIST'S DICTIONARY, Basic vocabulary for reading old Greek documents. I received a copy of it today and will be keeping this handy booklet close by as I try to decipher Greek documents. “One of the hardest aspects of Greek genealogy is reading and translating the old Greek records. Based on our team’s research experience, this dictionary was created to help English-speaking researchers translate and understand basic lines of an old Greek document. We managed to create a wide database of more than 400 words, which, expanding geographically and socially, wishes to cover the most crucial translational needs of a Hellenic genealogist”. DANIEL FRONTINO FLASH is a graduate student at San Francisco State University where he earned a BA degree in an interdisciplinary special major, Mediterranean Languages and History, which included the study of modern Greek, Italian, and Arabic. His graduate work focuses on American immigrant and labor history.